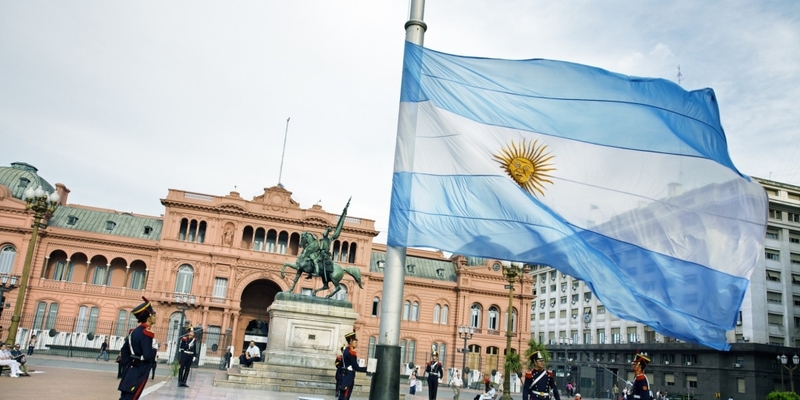 Argentina’s recent economic boom has made it a magnet for international business. This has also made it an attractive destination for numerous foreign talents as more and more opportunities become available in Argentina every year. With many Canadian businesses and individuals set on Argentina as their new destination, they quickly realize that there are multiple processes that they need to go through before they can make their dreams a reality. Whether for corporate or personal reasons, you will need a series of Canadian documents for use in Argentina. However, before these documents can be accepted in Argentina they have to through a process of validation to ensure they are legitimate. If you have been in contact with requesting parties in Argentina, it is likely you have been told that you need to have your documents apostilled. Although Argentina and many other countries use the apostille process of validating foreign documents, Canada has not signed the Hague Apostille convention and uses an alternative two-step process that is equal to an apostille. The first step is authentication at Global Affairs Canada, and the second is legalization at the consulate of Argentina. In theory, authentication and legalization is very simple: it involves validating signatures on documents. In practice, authentication and legalization can get very complicated and take a very long time. Each step has a series of requirements that needs to be met before it can be completed. Additionally, authentication at Global Affairs Canada can take as long as 20 business days. This is excluding the time it takes for the Argentinian consulate to legalize your documents afterwards. Furthermore, there is more than one Argentinian consulate in Canada and each Canadian document has jurisdictional rules for where they will need to go for legalization. As you can imagine, without assistance preparing your Canadian documents for use in Argentina can take months. For many, especially businesses, this is not an option; there are deadlines that need to be met. Thankfully, there is an easy solution: ALSC. As the first provider of this service over 25 years ago, we at ALSC have become experts in every Canadian document for use abroad. From Certificates of Incorporation, Articles of Incorporation, GMP, CPP, and ITC to police checks, pension letters, birth certificates, and marriage certificates, we have consistently provided the highest quality service in our industry to thousands of Canadian businesses and individuals. Our service guarantee is our backbone: we guarantee that we will make your Canadian documents valid for use in Argentina. Our priority same day, standard 3 day, and economy 10 day authentication service speeds have become the industry standards and allow us to save you as much as 20 business days from your total processing time. Our hard work with the Argentinian consulates in Montreal and Toronto over two decades has resulted in a strong relationship built on reliability and trust: they know we always get it right. We are always up to date on their changing fees and requirements which are often the primary cause of delay. 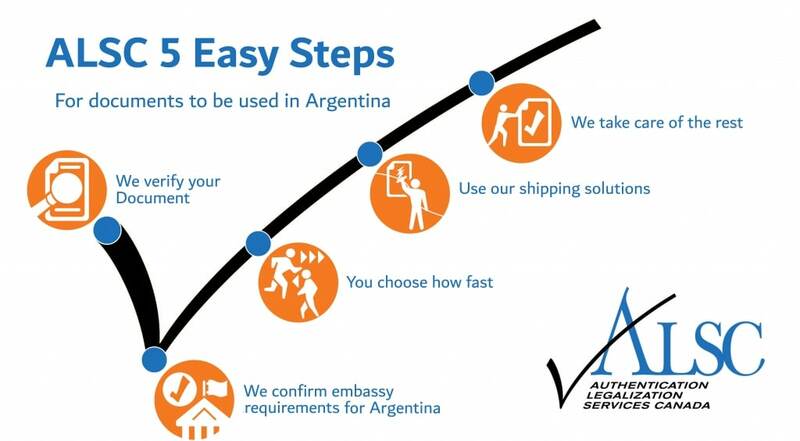 Once your documents have been authenticated by Global Affairs Canada and legalized by one of the consulates of Argentina we can send your documents anywhere in the world they need to go via one of our shipping partners. When you use our services you get your own personal agent to answer your questions and address any concerns you may have. We will also update you at every step of the process to ensure you are always in the loop. Once we have helped you prepare your documents and they have been sent to us, the only thing left for you to do is relax while we take care of the rest. If you have Canadian documents that need authentication and legalization for use in Argentina and have to meet a deadline, we strongly advise you contact us immediately. We will ensure your Canadian documents are ready for use in Argentina with minimum delays and maximum efficiency. Continue reading for additional details on Canadian documents for use in Argentina and how we can help. Argentina has become a very promising country for business endeavors in South America. If you are a Canadian business looking to expand your markets, partner with Argentinian corporations, or diversify your existing subsidiaries in Argentina, your documents will need to go through the authentication and legalization process. The documents you will require will depend entirely on your purposes, the demands of the requesting party, and any associated processes that you will have to go through once your documents have been accepted in Argentina. We repeatedly emphasize the importance of frequent and clear communication between our clients and their requesting parties in Argentina as there have been instances where the required documents change without notice and our clients are left scrambling to process additional documents at the last minute, usually at a larger cost. Some of the documents you may required include Certificates of Incorporation, Certificates or Origin, Commercial Invoices, Articles of Incorporation, Articles of Amalgamation, and Corporate Powers of Attorney. As an existing corporation, you should already have some of those documents somewhere on hand. If not, it is easy to order them from federal and provincial bodies such as Industry Canada. If you need to order documents such as Certificate of Incorporation, Articles of Amendment, and Articles of Amalgamation, the forms to do so can be found by clicking here. Another document which may be requested of you for business purposes in Argentina is a Canada Revenue Agency Certification of Canadian Residency for Tax also known as a CRA Certificate of Residency. This document is used to reduce or eliminate taxes on your foreign income and further validate your status as a Canadian business to parties in Argentina. Click here and follow the steps to get your CRA Tax Certificate of Residency for use in Argentina. Once you have it, it will need to be notarized before it can be authenticated and legalized. Like most Canadian documents, your corporate documents will require the stamp, seal, and signature from a notary public or lawyer. Most lawyers also have templates of various corporate documents such as Corporate Powers of Attorney and can draft these for you as well. Some of our clients prefer to make notarized copies of their original corporate documents as some original corporate documents are difficult to have re-issued, or simply cannot risk being damaged or lost. Again, make sure to check with the appropriate authorities in Argentina if notarized copies of your corporate documents will suffice. If this is something you decide you would like to do, we can make notarized copies for you when you use our services and can provide affordable return shipping for the original documents upon completion. Another option which some businesses take advantage of is using the Canadian Chamber of Commerce here in Ottawa. The Canadian Chamber of Commerce has a “TradeCert – Certification Made Simple” service which can certify Commercial Invoices and Certificates of Origin for use in Argentina. Since the signatures of the Canadian Chamber of Commerce are recognized by Global Affairs Canada, they are valid for authentication and do not require any additional signatures from lawyers or notary publics. As proud members of the Canadian Chamber of Commerce, we can even pick up your documents at the chamber free of charge once they have been signed. Many of our clients choose to do this as it saves them quite a bit of time. We can even process your documents if you send us your completed TradeCert forms via email. If you are interested in this option, please contact our head office. It can save you a lot of time! Canadian vital statistics documents such as birth certificates, marriage certificates, and death certificates are probably the most common documents required for personal affairs in foreign countries. If you are looking to retire in Argentina, you may also require a Canadian pension letter along with a Canadian vital statistics documents to secure your benefits. Although these documents are very important, vital statistics documents are not used within Canada very often. This means that they are often damaged or misplaced over time which can be a big problem when one or more of them is required for use abroad. Luckily, its very easy to get your Canadian vital statistics documents if you are having difficulty finding yours or if it is in poor condition. Also, Canadian vital statistics documents are some of the easiest to process as the signatures on the documents are recognized by Global Affairs Canada and embassies usually have fewer requirements for their legalization. This means that they do not require any additional processes such as notarization. In short: they are ready for processing. They can still be notarized if that is your preference, but it is often less expensive to simply re-order your document from the issuing provincial body than to have it notarized. Furthermore, notarized copies of documents such as birth certificates, marriage certificates, and death certificates are not always accepted by requesting parties overseas. This is simply because it increases the chances that the documents might be fake. As such, it is always a good idea to double check with the requesting party in Argentina whether original Canadian vital statistics documents are required or if notarized copies will suffice. If you are unable to find your Canadian birth certificate, marriage certificate, or death certificate or if it has been severely damaged, you can use the links below to order a new one. If you need to do this we strongly recommend you have your document shipped directly to our office, especially if you are currently residing overseas. This is because in many cases we can have your Canadian vital statistics document authenticated and legalized for use in Argentina before it would arrive to you from Canada! Many of our clients choose to do this and those who have were very happy that they did. We know authentication and legalization can be incredibly stressful. Many of our clients come to us distressed and rushing to meet their deadlines for their affairs in Argentina. We are here to make it easy for you, regardless of your purposes. We know that it can sometimes be difficult to trust a third party with sensitive information which is why we always take every security measure at our disposal to keep your documents confidential. Our proud membership with the Canadian Chamber of Commerce, our A+ rating with the Better Business Bureau, and our numerous testimonials on Facebook and Google are evidence of our trustworthiness, efficiency and reliability. Furthermore, we pride ourselves in being the most accessible company in our industry. We have over a dozen service centers in many major cities across Canada, with more being added every year. If you live in or near our service centers in Vancouver, Victoria, Surrey, Calgary, Edmonton, Regina, Winnipeg, Toronto, North York, Mississauga, Halifax, or Montreal then you have a one-stop shop for authentication and legalization. Along with saving you a trip waiting in line at the post office, when you use our service centers your documents are given free priority shipping via FedEx to our head office for processing. Free shipping is also provided if you pick up your documents from our service center upon completion. We can also ship your documents elsewhere in Canada or the world by courier with one of our many shipping partners at an additional cost. Make sure you make an appointment with our head office before using our service centers, otherwise we may not be able to accept your documents. We are here to save you time, stress, and money in the long run. Click below to get started with ALSC, the experts in Canadian documents for use in Argentina.